The podcast returns with a little cricket and a lot of news. Andrew Nixon (@andrewnixon79) joins Russell Degnan (@idlesummers) to discuss the under-19 World Cup qualifiers (0:23), the Ireland (1:50) and Afghanistan (7:20) tours of Zimbabwe, the Africa T20 Cup (9:58), and the South American championship in Chile (13:11). There are lots of news topics to digest, including player eligibility issue for Suriname at WCL6 (17:17). From the ICC meeting there were mooted changes to the world cup qualification process (20:46) , the women`s world cup format (24:23), the formalisation of changes to funding for associates and affiliates (26:06), a renewed look at the Olympics (29:19), administrative problems in Nepal (34:18) and the end of WCL6? (37:52). There is more news from the Americas with the ICC team and the Warne-Tendulkar All-Star series (39:38), and globally: associate involvement in the WBBL (52:05) amongst some previews for WCL and Hong Kong`s tour of the UAE. Direct Download Running Time 55min. Music from Martin Solveig, "Big in Japan"
Batting form and the "hot hand"
There has been an interesting paper in circulation recently that deals with the idea of a "hot hand", which in cricket terms we`d refer to as "good form". It is primarily interesting because for several decades, the idea of streaks being anything other than random luck has been derided. Attempts to measure it in cricket have been few and far between, but there was little to suggest a batsman was more likely to score runs having just done so - or indeed, that they weren`t largely replicable with a random number generator. The paper in question upends a key piece of prior research because of a rather simple, but slightly counter-intuitive piece of statistics. The various explanationstend towards the counter-intuitive end of the scale but I`ll try to explain. The technique being used is very elegant: take an action that occurs roughly 50% of the time and measure the number of successes that follow a previous success. If they are completely independent, the subsequent attempt will continue to have a probability of 50%. If the successes are clustered around other successes, that number ought to be higher. 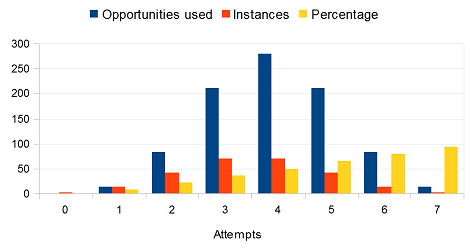 The distribution of opportunities to take a measurement is similar, but because it takes more successful attempts to generate higher opportunities, it is shifted slightly across, and centred around 4 (or n/2). The breakdown also demonstrates the key to the problem: if four opportunities are to be had, the attempts will be distributed in such a way that the average success rate is 50%. But the only way to generate 7 opportunities is to have succeeded in each of the first 7 measurements. The percentage will be either 6/7 (83.33%) or 7/7 (100%). And as a consequence, the average of multiple strings of measurements ought to sit not at 50% (the middle of the opportunity distribution), but at the centre of the instances of measurement distribution (plus a term for the two extras) - around 45% for strings of length 8. All very fascinating, particularly as it implies that previous studies showed a "hot hand" after all. But what does it say about cricket? The short answer is that this is a very elegant way of measuring form: find the median score for a batsman, if they surpass it, then test their subsequent score. For Tendulkar, who played so many innings that the expected percentage is close to 50, his test "form" saw a 53.1% success rate in innings where he`d surpassed the median (excluding not outs below the median). In ODIs however (counting only matches where he opened) the figure drops to 50.5%. That is only a single data point, and some batsmen are likely to be more prone to runs of form than others, but it also points to an issue. In ODI cricket, where multi-lateral series exist, a batsman tends to shuffle opposition quite quickly, and therefore face a reasonable variety of bowling strength from match to match. In test cricket, the subsequent innings is less likely to be independent from the first, without being held in identical conditions - the second innings being on a wearing pitch. Apparent runs of form may just be a string of matches against poor opposition. Conversely, ODI cricket may be less prone to form, being a format that requires a higher amount of risk-taking, and therefore more luck. Hence a discrepancy between test and ODI matches is feasible. Comparing all innings adds in time gaps when a player might fall out of form (and vice versa), and a proper study ought to remove them. The relative sparsity of innings means that when a player is really in form, it would be hard to distinguish between that and luck with any method. Most likely the effect is small - perhaps three or four runs on a batting average, but probably half that. Hence measuring the effect, if any, of form remains difficult. On selection matters, - the only avenue where form might matter - there is a lot to be said for judging a player on technique, temperament and overall career trajectory and ignoring runs of form. Everything else is largely academic, albeit an interesting question. It would be easy to point to the opening of this test match and say that Rogers and Warner batted as they ought to have throughout, laying a foundation foa big total, and allowing their bowlers to attack. But for the most part, Rogers and Warner tried (and largely succeeded) to make that foundation. The issue was that their inevitable failures (all failures are) resulted in cataclysms through the middle order. It isn`t clear whether Smith is a number three, as he is only making starts against the old ball. But as with the openers, he mostly did the job. A team should expect to be two down in the first hour relatively often, partcularly in England - it isn`t acceptable to turn that into all out by tea. The lessons of the last three Ashes series in England (if not every series in England, ever) remain unheeded. At home, Australia can largely avoid collapses because the pitches are flat. In England, there are times when the play is wth the bowlers and the side that lost (the series but also individual tests) in 2005, 2009 and 2013, was the one that failed to arrest the collapse, and wait for better conditions. Australia`s bowling showed similar flaws (as indeed they have in previous series), failing to keep control of the run-scoring when times were bad, and underestimating the value of putting the ball in the right spot consistently when times were good. Siddle, in this respect, ought to have played more matches. The allure of a 2013/14 Johnson and a 2015 World Cup Starc running rampant was too strong to exclude either; and the reputation Hazlewood has attained for being McGrath-like seems to have afflicted the judgement of his actual accuracy. In the end, the series rating shows this to be close, when actually, England`s victory was near inevitable given the fragility of Australia`s batting. A evidenced in this match, England have their own worries in this department, but they have a young side with talent, so they can expect to improve. Australia have gone from an old side to half a side within days of the Ashes ending. That is a problem for another day though. If you took Angelo Mathews out of this Sri Lankan side and they`d be a rabble. Chandimal provided runs in the first test, but in the following two, India managed consistent contributions across the board - with bat and ball - while Sri Lanka had two tons from Mathews, 14 wickets from Prasad and not a whole lot else. They didnt lose by a huge amount, but a failure to pass 306 in four innings nor keep India below 274 meant that they were well behind. The result pushes Sri Lanka beow New Zealand and lifts India above England, with a reasonable chance to move into third or better across the forthcoming series. Sri Lanka, meanwhile, need to stave off the West Indies, who they are slowly drifting towards. With so few contributions of note, and the loss now of Sangakarra and Jayawardene as well, it may be some time before they again challenge for the top few places in the rankings. The sort of low-scoring match that is exciting to watch unfold, and ought to be covered better. There were only three fifties in the match, and two came on the closing morning when Scotland looked briefly to have put themselves back in contention, after the top-order collapsed in both innings. The unlikely bowling of Borren capped the victory for the Dutch, after Rippon again provided the partnership breaker. Netherlands play so few first class fixtures it wasn`t until they won that you realised just how long they`d been poor. Their rating reflects the seven year gap between wins, and their form-line shows how far they have to regain any sort of respectability. If they can keep van der Merwe in the side though, coupled with the relatively solid and committed lineup that is playing well, they will move back to where they belong. Challenging for a victory in the I-Cup is unlikely - though not impossible, as neither Ireland nor Afghanistan look strong - but this victory did seriously dent the chances of the Scottish. Nominally an incredibly close series on neutral territory, in reality, Pakistan plays in the UAE as well as, or even better than they did at home. They are also facing a side that doesn`t play well in the UAE, is young, and notwithstanding the home win, recently drew series against lesser rank sides, in more familiar conditions. Compounding that, while Yasir Shah is a loss for Pakistan, his opposite spinners are prone to loose deliveries, and in Mooen Ali`s case, will need to open on top of the bowling workload, having been shifted out of number eight for Adil Rashid. It is questionable Wood offers a lot extra, on top of Broad and Anderson, with Stokes and two spinners. If England`s spinners can`t take the wickets required, then they`ll need to the extra batting moreso than the extra bowler. The benefit of three all-rounders being lost when the tail still starts at nine. If Pakistan play nearly as well as they did against Australia they`ll win this comfortably. They did subsequently lose to New Zealand, but that seems to be a growing trend, and in any case, was an unusual match in thr wake of Hughes death in Australia. Assuming their ageless batsmen don`t suddenly do so, England will be in for a difficult short tour. A series that exemplifies the need for the ICC discussions on context and bilaterals. Optimally, not having bilaterals series, and absorbing this contest (and it is a close contest) into a championship would make it less of an afterthought for fans and players alike. Sri Lanka`s plan will be the same as always: try and score enugh runs for Herath to grind the opposition into dust. The West Indies bowling lineup is as good as it has been in some time (Taylor, Roach, Holder, Gabriel) but they are sporadically world class, and the batting looks shaky. If they can make this close it will count as a success.